Kinsta’s hosting plans are based on the total number of monthly visits to your site on the server. The number of visits in a given month is the sum of the unique IP addresses seen each 24-hour period as recorded in the Nginx logs. We recently moved from a bandwidth-based pricing model over to a visit-based pricing model due to the fact that this is easier for many of our users to understand and calculate, and then settle on the appropriate hosting plan. Kinsta records the exact number of visits to your WordPress site that occur directly on the web server. You can see a summary of the visits in the MyKinsta analytics “Resource Usage” report and can currently filter it by the previous 24 hours, 7 days, or 30 days. The chart is fully dynamic and includes additional drill-down details. For example, if you highlight a specific point in time on the graph it will show you some comparison statistics, such as the total number of visitors being higher than the previous day, etc. Full log data in regards to analytics is retained for 30 days. If you are worried about going over your plans visits limit we suggest checking the dashboard and analytics section more frequently after first migrating to Kinsta. If you see an unexplained traffic spike or inconsistency, let our team know and we can further investigate the logs for you to help determine the cause. When a human arrives to your site and loads the page, this is a visit. When a human arrives to your site, and then browses to a new page, this is a still considered one visit. When a human arrives to your site from two different browsers, this is treated as one visit due to the fact that it is the same IP address. When a human arrives to your site at home and then later from work they will have used two different IP addresses to access the site and will be counted as two different visitors. This also means that every visit in a day from a given location will be only counted once no matter how many devices were used to load your site from that location as long as the visitor in question uses the same internet connection. It’s important to understand that third-party analytics tools might show something different from what we have calculated. This is due to the fact that every analytics tool uses a different set of data as the basis for their calculations and may or may not implement their own logic to attempt to show you the total number of real human visitors, after having filtered out bots and crawlers. All tools also show a different number based on the data they have collected and their own set of rules — what they consider to be irrelevant bot traffic and what they consider to be legitimate traffic. This means that in most scenarios, Google Analytics can’t count visitors who are using ad blockers. But these visits are still counted at Kinsta due to the fact that we are looking at visits to the server. There is no value generated by Google Analytics that is directly comparable to our visits count. We do not recommend using Google Analytics data as the basis for your estimate of monthly visits. 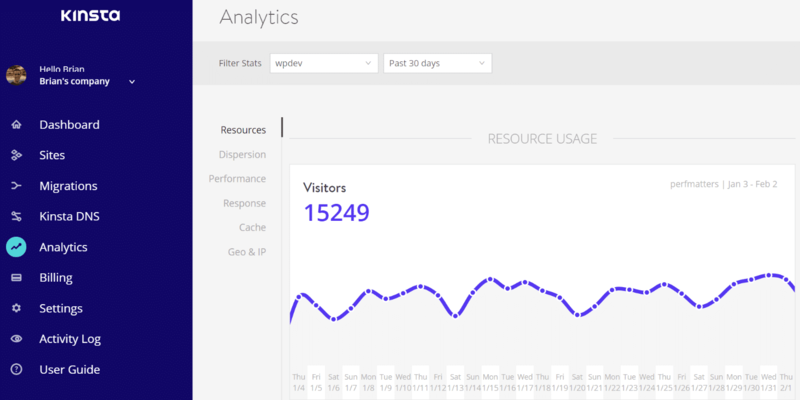 Cloudflare Analytics provides you with details regarding how many visitors hit your site. Simply log in to your Cloudflare dashboard and click on the “Analytics” tab. Cloudflare shows unique visitors for the entire time-frame you choose. Which means if you choose a weekly view the data points will show daily uniques but the weekly visitor count at the top of the chart will count unique visitors throughout the whole week, regardless of how many times they visited the domain on daily basis. To properly compare Cloudflare’s visitors to Kinsta, you can either add up the daily visitors individually or pick a single day, let that be the average, and multiply it. Let’s use the screenshot above as an example. When we total up the daily visitors (70k + 60k + 60k + 55k + 62k + 105k + 80k) they actually add up to 492,000. This is how to get the total that will be closer to what you see in Kinsta. Our numbers aren’t higher than Cloudflare, but we do use a different calculation method. There are many other server statistics packages available on the market today, one of which may be installed on your current server. If you have access to statistics on your current server you can probably locate information which will allow you to estimate visits with a large degree of accuracy. 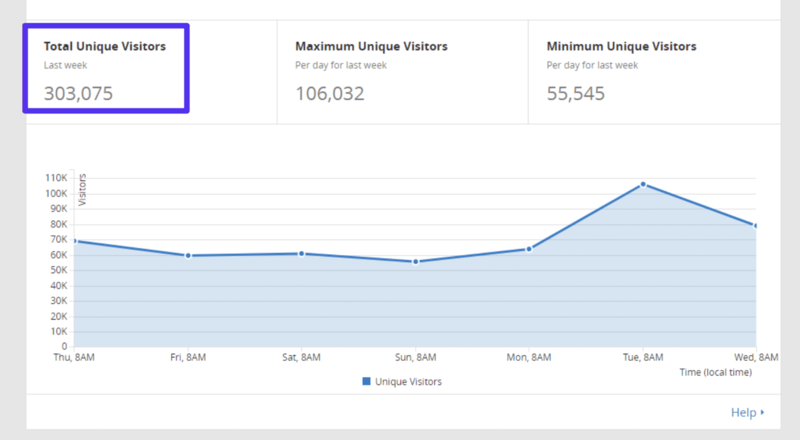 The key here is to understand how the server statistics package on your current server counts visits, and how that compares to how Kinsta counts visits. We’ve already explained how we count visits in this article. You may also need to do a little research to understand how the statistics package on your current server counts visits. Once you’ve done that you’ll be able to use the statistics on your current server to create an informed estimate of what visits will look like on our platform. AWStats is one such program that is included by many web hosts who use cPanel. 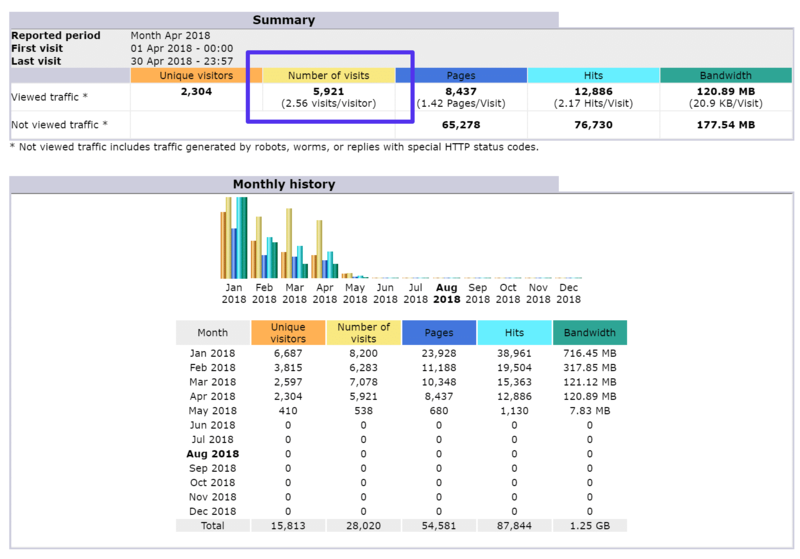 If you have access to AWStats, their “visits” count is similar to our visits calculation and should provide a reasonable estimate of visits for the purposes of sizing a hosting plan. To find this data, log in to cPanel and click on “Awstats” from within the “Metrics” section. Look for the total in the “Number of visits” column. When a bot visits your site, it may or may not be counted as a visit. Bot traffic requires server resources (RAM/CPU/bandwidth), as such, some bots might be included in your total visits count since our servers still have to serve those visitors. We exclude properly identified bot traffic as a courtesy, but ultimately bot traffic takes just as much work for our servers as human traffic. If you are struggling with a large discrepancy or excessive bot traffic, we recommend implementing a web application firewall (WAF) from a reputable security solution provider such as Cloudflare or Sucuri. These services have extensive databases of what should be treated as “bad” traffic, and traffic from these “bad” IP addresses is prevented from ever hitting your Kinsta site. Many of our clients see much less of a discrepancy between our analytics and what Google Analytics and other tools report after utilizing one of these services. This can, in turn, can save you money by limiting the size of the hosting plan needed for your site. Additional IP or User-Agent banning rules can also be added by our Kinsta support team. For example, if you need to deny a specific User-Agent or IP address simple share that information with our support team who will add a rule blocking that traffic source from your site. Due to how our infrastructure works, this should be done at the server-level and not with a WordPress plugin. Please open up a ticket if you need assistance. In conclusion, every analytics program or package uses its own data set and calculation methodology to generate analytics. At Kinsta, our count of visits is based on the raw access logs tracking the IP addresses that request resources from your website and excludes known bots. Because every program uses its own data and methodology we cannot guarantee a perfect match between our analytics and those generated by another program. However, if you have access to another analytics program that uses server access logs to count up unique user IP addresses (such as Cloudflare or AWStats), that information can be used as a basis for estimating how many visits your site will receive when hosted at Kinsta.